LATEST BTEUP Result UPDATE dated 16.04.2019 : Good News !! BTEUP has announced Scrutiny & UFM Result for December 2018 Odd Semester Exam. Only 50 Students passed & Marks of 257 Students increased. Check Your Result from links given below..
BTEUP Even Semester/ Annual System/ Back Paper Proposed Exam Scheme has released Now. UP Polytechnic Annual Exams will now conduct from 04 June, 2019.Practicals will start from 15 May, 2019. Download BTEUP Even Semester/ Annual System Date Sheet 2019 from links below…. BTEUP Odd Semester Exam Result 2018 has announced Now Today 11 February, 2019. If any student got failed in 4 Subjects then still he/ she will be promoted to next semester. Check BTEUP Odd Semester Exam Result 2019 from links given below…..
BTEUP has announced UP Polytechnic Diploma Even Semester Scrutiny Exam Result 2018. Candidates can check BTEUP Scrutiny Result 2018 from link given below……Good News for Polytechnic Students !! Now Correction in their result will be done in College itself. Read Full News Image given below..
About BTEUP : State Board Of Technical Education and Training” was set up in the state in May,1958. The Board conducted its first examination in 1960,for courses of diploma level and also for Draughtsman Certificate Course. The name of the state Board was changed to “Board Of Technical Education” in 1962.In the same Year, the “U.P. Pravidhic Shiksha Adhiniyam – 1962” was enacted awarding the Board statutory status. In the year 1962, year of its inception, the Board held the examination of about 2500 students, in three major disciplines of Civil, Electrical and Mechanical Engineering at 25 different Centers/Institutions. 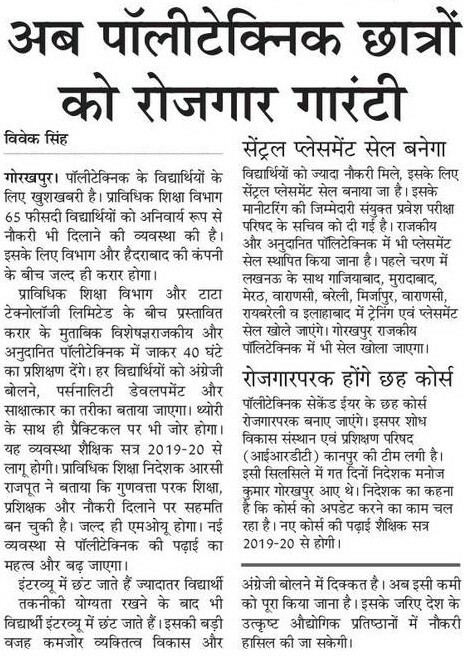 The Board now examine and approve the syllabus developed by IRDT, Kanpur and prescribe it for institutions affiliated to Board of Technical Education, U.P. About 1,05,000 students in the 60 different disciplines of one year, two year, three year and four year durations are being examined at present, in the institutions, affiliated to the Board. The Board of has been constituted under U.P. Pravidhic Shiksha Adhiniyam – 1962. It has a Chairman and a Vice-Chairman and, 40 memebers nominated by the state Government. Secretary ,Board Of Technical Education is ex-officio member secretary of the Board. At Present there are 126 Government Polytechnics, 468 Private Polytechnics & 18 Aided Polytechnics. Exams conducted by BTEUP : BTEUP Every Year conduct Semester Exams for various Diploma Courses. Semester Exam divided in even & odd semester Exams. Exams for all Diploma Courses conducted in same time. BTEUP also conduct Exams for Special Back Paper & Back Paper Examination, Multi Point Entry & Credit System. Separated Date Sheets uploaded by BTEUP for Polytechnic Diploma Courses. BTEUP will announce Result for Odd Semester Exam 2018 which conduct in month of January 2019. Exams for various Diploma Courses 1st Year, 2nd Year, 3rd Year conducted from 08 to 18 December, 2018. Information will be available for BTEUP 1st Semester Result 2018, BTEUP 2nd Semester Result 2018, BTEUP 3rd Semester Result 2018, BTEUP Odd Semester Exam Result 2018, BTEUP December Exam Result 2018, BTEUP Odd Semester Exam Result Date, BTEUP December Exam result 2018, BTEUP Even Semester Exam Result. So Keep in touch with us for Result Updates. BTEUP Special Back Paper Exam Result 2018 : BTEUP conduct Backpaper & Special Back Paper Exams for Candidates who failed in one or More Subject in Diploma 1st Year, 2nd Year, 3rd Year. These Exams also conduct semester wise. Information regarding BTEUP Odd Semester Special Back Paper Exam Result 2018, BTEUP Even Semester Back Paper Exam Result 2018, Back Paper May Exam Result Date 2018 will be available.